Generous, or what!! I was so busy enjoying the chocolate, I nearly forgot to grab a picture before I ate it all (ahem, I mean shared it amongst my family...) Those two boxes of chocolate ballotins shown in the photo above are in fact, empty - due to a small case of immediately being devoured! I'm so glad I received the Zesty Lime bar in the hamper - this is my favourite of the bars. It's the right amount of cocoa content without it being too bitter and the lime infused in delicious crunchy bits are spread evenly through the bar. So, so good. I also like to grate this chocolate bar over key lime pie that I bake, as a finishing touch. It really adds a bit of deliciousness to the dessert. The hot chocolate swirl, does exactly what it says on the tin - swirl it in hot milk and voila!, tasty hot chocolate for your drinking pleasure. The chocolate bars and the individual hand made chocolates were all enjoyable. The milk chocolate doesn't have a waxy texture and it melts pleasantly in the mouth. 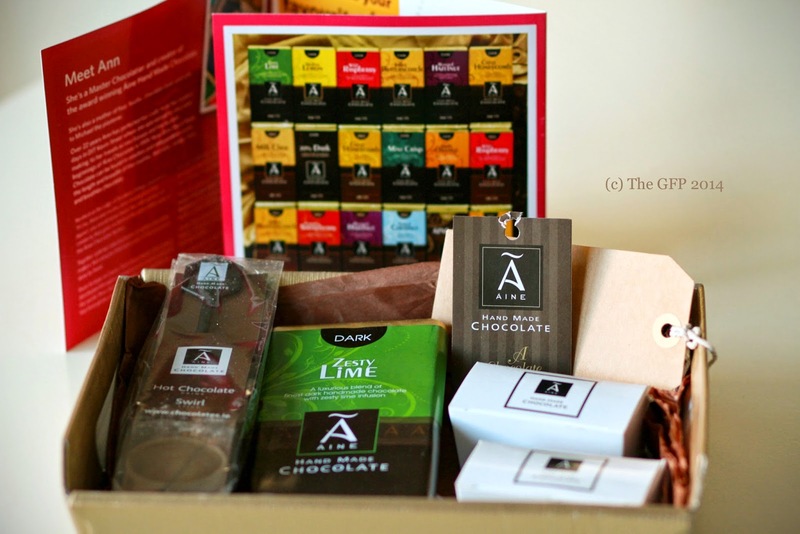 To quote from the website, 'Áine Hand Made Chocolate - the luxurious taste of heavenly hand made Irish chocolate from award winning Master Chocolatier, Ann Rudden. This is chocolate as it should be - mouth watering, melt-in-the-mouth magic.' That pretty much sums it up for me. So ends, my admittedly very gushing, review. Go and taste for yourself.